This is the scientifically-derived mathematical formula for the perfect handshake. The algebraic expression supposedly takes into account the twelve primary measures needed to convey respect and trust to the recipient. What does this have to do with cars. Nothing. That didn't stop Chevy UK from creating this tongue-in-British-cheek formula to express the perfect handshake. 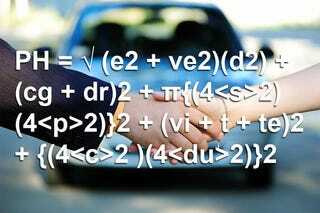 No, seriously, they claim the mathematical formula was developed for the car brand as part of a handshake training guide for its staff to prepare them ahead of the launch of its new "5 Year Promise" offer, which aims to offer "peace of mind and reassurance to its customers." We're also hoping it offers a warranty on the Lacetti. At least they have a sense of humor, no matter how bad it is. Try getting even a bad joke out of the Chevy U.S. PR team. Perish the thought.